What's next in helmets: Want a Bell Star custom-made for your head? When Bell offered the chance to tour their HQ in Santa Cruz, Calif., and hinted that it wouldn't be a waste of my time or gas money, I jumped at the chance. When I first got into motorcycling, I thought of Bell as a company resting on its heritage and associated the brand mostly with the Custom 500 retro helmets, which didn’t fit me particularly well. Much later, the Transitions photochromatic lens came out and I had an opportunity to review the Bell RS-1. This doesn’t need to become a Bell RS-1 review, so let’s just say it blew my Shoei RF-1100 out of the water, for me at least. The matte finish was far nicer, the helmet rode much quieter and was more comfortable, and the Transitions lens was everything I’d hoped it would be. The Bell Star Carbon was another exceptional helmet and, more recently, I’ve heard nothing but positive reports about the Bullitt, which combines retro aesthetics with a design that really works. It was embarrassing that my first assumptions had been so wrong and I would have felt terrible about it if I didn’t love it so much when things are far better than I expect. So, like I said, I was really excited to see what the cryptic line from Bell’s e-mails (“we know you’ll get plenty to write about”) meant. These tours are usually led by the company’s press relations person, who tailors answers to what we’re allowed to know. I was pleasantly surprised when I discovered that while a press relations person was available all day, he was going to have the Vice President of Product Creation and the Product Manager lead the bulk of the tour and I could ask whatever I wanted. The lobby is a small museum showing how Bell products have evolved or been influential over the years. Giro (bicycle helmets) and Riddell and Easton (sports helmets) are also under the Bell umbrella, so the company is dedicated to protecting people’s heads in a variety of ways – and they’ve been doing it for 60 years. The company sells 11 million helmets a year and has about 55 to 60 people across all four brands who are just dedicated to research and development. They showed me clear examples of technologies they’ve been able to share across platforms, and the next part of the tour would help me understand why. We walked through a set of glass doors into a large room full of cubicles. Don’t think Office Space, think Social Network. Lots of young-ish people dressed like they weren’t worried about a dress code in an atmosphere that felt designed for collaboration. As it turns out, I was standing amidst the teams for Giro Helmets, Bell Dirt Helmets and Bell Street. I immediately remembered being told about one of the ideas that came from Giro that was then modified for Bell’s street helmets. Now it made sense to me why they are able to learn from each other so easily – they’re sitting next to each other, sharing what they were working on just as naturally as you share things with your friends at your office over lunch. Next up was the testing facility. Inside their lab, they had a plethora of machines to do testing on a wide variety of their products. They had all kinds of impact tests, stress tests, and various ways to examine their products. They explained a bit about the DOT, SNELL, and ECE standards and the different kind of tests they used in house to make sure their products were compliant (official ECE certification is in the works). The Bell crash testing facility. Photo by Sean MacDonald. More important than the kinds of testing they do – or at least more relevant to our purpose here – is the location of the testing facility. Instead of sending a sample of their helmets out to be tested, a process that normally takes weeks, they simply walk across the room. Not only that, but the feedback provided isn’t in an e-mail or a report from a third party lab tech, it’s in person and from one of their own testers who can offer guesses on reasons why the helmet is performing a certain way and possibilities for improvement. The bar is no longer “does it pass,” but “how did it do and how can we make it better.” Obviously official testing to obtain DOT and Snell certification is done off site and by a third party, but having access to such a facility helps them focus on making their helmets better instead of just passing a test. One of their lab guys was on hand with some helmets that one of their local racers has worn and crashed in. Using the side of the helmet that wasn’t damaged, they ran through some of the tests required to meet DOT and SNELL certification. Let me tell you, the 7.5-meter drop required for a SNELL certification is a big drop. Bell Moto 9 test from our demonstration. Bell photo. DOT requires that the helmet receive the same stress test, in the same place, twice in a row and still remain under the 300G mark. The tests on this helmet, which had already been crashed in, returned sub-200G levels. We walked down a short hallway next to “company parking,” a.k.a. an indoor bicycle rack stuffed to the brim with the staff’s bicycles, and into the 3D printing room and model production room. These tools allow the Bell designers to take their ideas from CAD or their tiny molds and have models built so they can actually get an idea for how they work in person. One example they gave was of a helmet they made with different buttons along the top, each corresponding to a different ventilation pattern they were looking at. They were able to go out and ride with it, then come back and make adjustments, print a new mold, and go ride with the new one all in the same day. This kind of agility allows designers and R&D teams to stay at the forefront of helmet design and innovation – and it’s far too rare in companies their size. One thing I found very interesting was the way Bell releases products. Instead of starting with an entry-level helmet to test the segment in an area, they start with the flagship and then work their way backwards. This allows them to spend money on the research and design of the products until they have it just right, knowing that the product will be worth the effort. From there, they find ways to scale back the cost while keeping the flagship model’s DNA. They said this was the only way they could make a helmet like the Bell Qualifier, which utilizes everything Bell learned from making the Star but in an entry-level package. You can even use the Transitions visor with it. They attributed their ability to participate in so many markets (Dirt/Sport/Street/Classic) pretty much completely to this philosophy. I think it’s also a genius marketing strategy, since it means your new, more budget offerings have the same design language as your established flagship models. Sort of the “Ford grille looking like an Aston Martin” thing, but all within a single brand. Quit making me wait, what’s new? 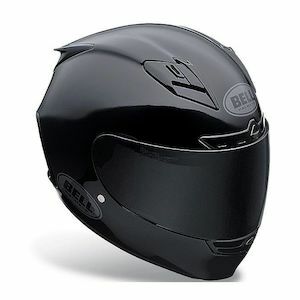 So here’s the news flash: Bell will make a Star Carbon or a Moto 9 that is custom fit to your head, just for you. I’d heard of this program, but thought it was something they were doing for their racers and assumed it was years in the distance for ordinary riders. Imagine my surprise and delight when, as they began telling me about it while walking down a hallway, we entered a room with a guy holding a head sock and some kind of scanner gun. It was almost exactly two years ago when AGV announced that it was making a helmet for Valentino Rossi using a custom scan of his head, which we all know now as the AGV Pista. It’s an awesome idea, but I’ve actually been surprised by the Pista’s sales, since it seems that Rossi’s head shape probably isn’t all that common and therefore the Pista offers little advantage beyond the interesting bragging point. Not my most flattering headshot. Bell photo. By comparison, the Bell Custom Fit program is alive and accessible, even if you aren’t a racer or super-lucky motorcycle journalist. They’re still working on how to scale up their production of it as there are some obvious hurdles, but the Bell team was at the MotoGP round in Austin scanning heads and taking orders for custom-fit Star Carbon or Moto 9 helmets. In fact, even if you aren’t ready to plop down your credit card for a new custom helmet, Bell wants you to get scanned anyway. They have some amazing ideas in the works for the future of helmet fit and they’re trying to catalog as many scans as possible to help guide their design. The U.S. Military has already provided scans of every member’s head. In addition to the Custom Fit Program, Bell has some neat things in store. They are working with one company whose sole purpose is military development of a new anti-fog coating that will be as effective as the pin-lock system, but without the distortion issues that come from using two lenses. They’re also playing with massive improvements in field of vision, an idea that came about by one of the designers almost being hit on his motorcycle after not seeing a car merging in behind him. One other area they hinted at making headway on was the material used inside helmets and its effectiveness with energy (impact) management. The team started to sort of hem and haw about what they could say at this point and I told them not to worry about it, I was just glad it was on their radar. The fact that they were excited about it is good enough for me. Over lunch, they were asking questions about my perspective and I began to share an opinion about a flaw I see in a lot of helmets that has never really been addressed in a major way. They all got looks on their faces like I’d touched on something close to home. There’s not much I can tell you, but I will say I like where they’re headed. I’ll follow up with a more expansive breakdown of the Custom Fit Program, as well more news on their other projects as we get more information. At the end of my visit, I left thinking that what I appreciate most of all is that Bell is working to push the whole market forward in a major way. It’s our heads that are on the line.